After several frequent requests from STH readers, today we are finally launching our FREE Selenium Tutorial series. In this Selenium training series, we will cover all Selenium testing concepts and its packages in detail with easy to understand practical examples. 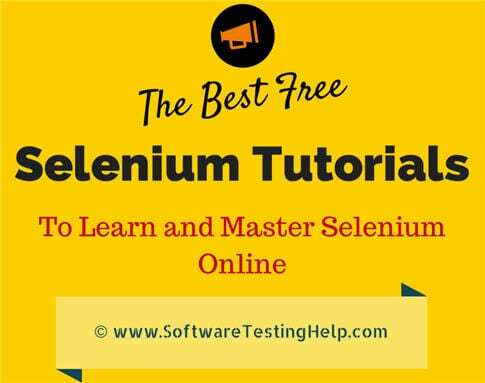 These Selenium tutorials are helpful for beginners to advanced level Selenium users. Starting from the very basic Selenium concepts tutorial, we will gradually move on to the advanced topics like Framework creation, Selenium Grid, and Cucumber BDD. Note: We will be increasing our article posting frequency for this series. Please don't miss any tutorial. Keep a track of all the tutorials by bookmarking this page as we will keep updating it with the links to all new Selenium tutorials. All Selenium Training Tutorials are listed below for your handy reference. How to start Learning Selenium? This is the best time to start learning Selenium testing by your own with the help of this free Selenium Training series. Read tutorials, practice examples at your home, and put your queries in the comment section of the respective tutorials. We will address all of these queries. Experienced Selenium professionals – you too can take part in this series by providing answers to the reader's queries in comments. This is one of our serious effort to help you learn and master one of the most popular software testing tools! We are much delighted to launch our yet another series of software testing training tutorials. The belief behind introducing this tutorial is to make you an expert in one of the widely used software test automation solution, Selenium. In this series, we will look at the various facets of Selenium. Selenium is not just a tool, it is a cluster of independent tools. We will look into some of the Selenium tools in detail with practical examples wherever applicable. Before you jump into reading this exciting and useful series, let us take a look at what it has got in store for you. The current industry trends have shown that there is a mass movement towards automation testing. Hence a cluster of repetitive manual testing scenarios has raised a demand to bring in the practice of automating these manual scenarios. There are several Automation testing benefits which are well understood and largely talked about in the software testing industry. What is the best tool for me to get my tests automated? Is there a cost involved in it? Is it easy to adapt? Selenium is one of the most popular Automated Testing suites. Selenium is designed in such a way to support and encourage Automation Testing of functional aspects of web-based applications and a wide range of browsers and platforms. Due to its existence in the open source community, it has become one of the most accepted tools amongst the testing professionals. Selenium supports a broad range of browsers, technologies, and platforms. Selenium is not just a single tool or a utility, its rather a package of several testing tools, hence it is referred as a Suite. Each of these tools is designed to cater different testing and test environment requirements. Selenium RC and WebDriver, combined together are popularly known as Selenium 2. Selenium RC alone is also referred as Selenium 1. Selenium is a result of the continuous efforts by an engineer named Jason Huggins from ThoughtWorks. Being responsible for the testing of an internal Time and Expenses application, he realized the need for an automation testing tool in order to get rid of repetitive manual tasks without compromising the quality and accuracy. Henceforth, Jason started demoing the tool to a vast audience. Eventually, the discussions were laid out to categorize this tool in an open source category and its potential to grow as a re-usable testing framework for other web-based applications. The tool was later acclaimed with the name “Selenium Core”. Selenium IDE is the simplest and easiest of all the tools within the Selenium Package. Its record and playback features make it exceptionally easy to learn with minimal acquaintances to any programming language. With several advantages, a few disadvantages accompanied Selenium IDE, thus making it inappropriate to be used in case of more advanced test scripts. The disadvantages of IDE are really not disadvantages of Selenium, in reality. Rather they are just limitations to what IDE could achieve. These limitations can be overcome by using Selenium RC or WebDriver. Selenium RC is a tool written in Java to allow a user to construct test scripts for a web-based application in any programming language he/she chooses. Selenium RC came as a result to overcome the various disadvantages incurred by Selenium IDE or Core. Loopholes and restrictions which were imposed while using Selenium Core made it difficult for the user to leverage the benefits of the tool to its totality. Thus it made the testing process a cumbersome and a far-reaching task. One of the crucial restrictions was Same Origin Policy. The problem with Same Origin Policy is, it disallows to access the DOM of a document from an origin that is different from the origin we are trying to access the document. Origin is a sequential combination of scheme, host, and port of the URL. For example, for the URL http://www.seleniumhq.org/projects/, the origin is a combination of HTTP, seleniumhq.org, 80 correspondingly. Thus, to test any application using Selenium Core, one has to install the entire application on the Selenium Core as well as a web server to overcome the problem of same origin policy. So, In order to govern the same origin policy without the need of making a separate copy of Application under test on the Selenium Core, Selenium Remote Control was introduced. While Jason Huggins was demoing Selenium, another fellow colleague at ThoughtWorks named Paul Hammant suggested a workaround of same origin policy and a tool that can be wired up with a programming language of our choice. Thus Selenium RC came into existence. Unlike Selenium IDE, Selenium RC supports a wide range of browsers and platforms. The user creates a test script in the desired programming language. For every programming language, there is a designated client library. Client library deports the test commands to the selenium server. Selenium server delivers the test results to the client library. A Programming Language – Java, C#, Python etc. An Integrated Development Environment –Eclipse, Netbeans etc. A Testing Framework (optional) – JUnit, TestNG etc. Please refer the following figure to more about the advantages and disadvantages of Selenium RC. With selenium RC, the life of a tester has always been positive and favourable until the emerging trends raised a demand to execute the same or different test scripts on multiple platforms and browsers concurrently so as to achieve distributed test execution, testing under different environments and saving execution time remarkably. Thus, catering these requirements Selenium Grid was brought into the picture. Selenium Grid was introduced by Pat Lightbody in order to address the need for executing the test suites on multiple platforms simultaneously. WebDriver is clean and purely an object-oriented framework. It utilizes the browser’s native compatibility to automation without using any peripheral entity. With the increasing demand, it has gained a large popularity and user-base. Refer the following figure for more information about the advantages and disadvantages of WebDriver. Selenium 3 is an advanced version of Selenium 2. It is a tool which is focused on automation of mobile and web applications. Stating that it supports mobile testing, we mean to say that the WebDriver API has been extended to address the needs of mobile application testing. The tool is expected to be launched soon in the market. With the advent and addition of each new tool in the Selenium suite, environments and technologies become more compatible. Here is an exhaustive list of environments and technologies supported by Selenium Tools. In this tutorial, we tried to make you acquainted with the Selenium suite describing its various components, usages, and their advantages over each other. Selenium is a suite of several automated testing tools, each of them catering to different testing needs. All these tools fall under the same umbrella of an open source category and support only web-based testing. Selenium suite is comprised of 4 basic components; Selenium IDE, Selenium RC, WebDriver, and Selenium Grid. The user is expected to choose wisely the right Selenium tool for his/her needs. Selenium IDE is distributed as a Firefox plug-in and it is easier to install and use. The user is not required to possess prior programming knowledge. Selenium IDE is an ideal tool for a naive user. Selenium RC is a server that allows a user to create test scripts in the desired programming language. It also allows executing test scripts within the large spectrum of browsers. Selenium Grid brings out an additional feature to Selenium RC by distributing its test script on different platforms and browsers at the same time for execution, thus implementing the master-slave architecture. WebDriver is a different tool altogether that has various advantages over Selenium RC. The fusion of Selenium RC and WebDriver is also known as Selenium 2. WebDriver directly communicates with the web browser and uses its native compatibility to automate. Selenium 3 is the most anticipated inclusion in the Selenium suite which is yet to be launched in the market. Selenium 3 strongly encourages mobile testing. In the next tutorial, we would be discussing the basics of Selenium IDE, its installation, and the features. We would also have a look at the basic terminologies and nomenclatures of Selenium IDE. A remark for the readers: Our next tutorial of the Selenium training series is in the processing mode, meanwhile you can explore a bit about the Selenium suite and its tools by looking at its official website. Shruti Shrivastava (our main author for this series), Amaresh Dhal, and Pallavi Sharma are helping us to bring this series to our readers. Shruti is currently working as a Senior Test Engineer with 4+ years of automation testing experience. She is an ISTQB certified professional and also an active blogger, always interested in solving testing-related problems. Amaresh is having 5+ years of manual and automation testing experience with expertise in WebDriver, Grid, and frameworks. Pallavi Sharma has 7+ years rich experience of working in automation testing field with hands-on Selenium and JAVA experience. Stay tuned and share your views, comments, and knowledge to help us, groom. Also, let us know if you think that we missed out something so that we can include them in our subsequent tutorials. How to create test case for login page in selenium ide if there exists captcha code. Hi Vijay, I need your help in setting up Selenium Webdriver environment in my system. My both system has Windows 7 & 8 and Java 32 bit. Please help me with the right eclipse version which can identify selenium commands. I tried many of the eclipse version which throws typical error in sendkeys command. Thanks for such a nice tutorial which I am trying to follow and learn. Thanks for this article post. It is really useful introduction for beginners. It’s really gonna help me. what are all the basic things i should have to know before starting selenium tutorial? I am unable to automate the Authentication popup. I am doing this for the Dynamic CRM. Please help me out with this. Thanks to all Software Testing Help team to presents a selenium tutorial series. Its a very useful tutorial for a beginner to learn from scratch. wat does High ROI mean? Thanks for info, everything about selenium is available at one source. I would like to get training on Selenium. So, can you please let me know what will be training duration and fees for the same? Hi, Can you any one tell me “Free automation tool” is available in Market for Mobile application (iOS & Android apps)? im new in selenium web drive testing, so briefly explain that concept. I this tutorial available in PDF format? It’ll be great if it is.. Thanks a lot for this much awaited tutorial. Nicely written so easy to understand. Great job Team STH. Thank u for your dedication towards us. Very nicely explained that can be easily understood. I have located element individually in both browsers as well with there respective tools (For ex: Identified relative xpath for an element which is common and element is located in both the browsers). I have tried with the methods to overcome this kind of issues by searching in google and relevant sites but those are not working. So, if anyone knows regarding this kind of issues and probable methods to resolve then request to please let me know. Thanks u r doing nice social work. thanks for the all the information provided above , some of the information is really helpful. Thank you very much. This series is very helpful. Can you explain what is happening in real time agile methodology in company. How they are implement agile and from bigining to project realise. Please share knowledge about how to test fields like Editor,Drag&Drop & Panel in Selenium. You Guys Really ROCK ,OMG , such a useful content for any one , who is confused from where to start on Selenium. Stupendous Job . Great work . I can’t stop myself without praising .KUDOS the whole softwaretestinghelp, infact i have been following this site since lang. i want to learn selenium testing. i don’t no any programming language. I have read your post and very much pleased to know about Field Automation Software. thanx…..very much.but please can u mail me this selenium material please. Why should we use System.SetProperty for Chrome and IE browsers? please tell me which selenium version is suitable for firefox version.